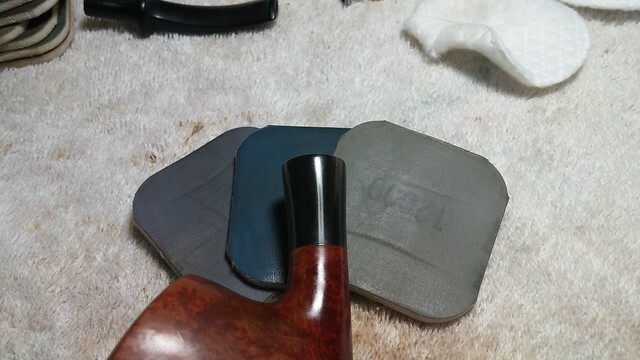 Regular DadsPipes readers will not be surprised by now to find out that the Stanwell Shape 19 is yet another Sixten Ivarsson design, and a classic shape in Stanwell’s catalog. 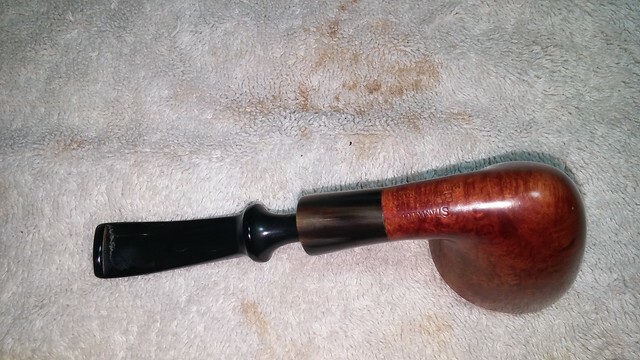 Bas Stevens, in his list of Stanwell shape numbers, characterizes the design rather drily as “Bent, triangular bowl, saddle mouthpiece” – a bland description that doesn’t, in my opinion, do the pipe justice. 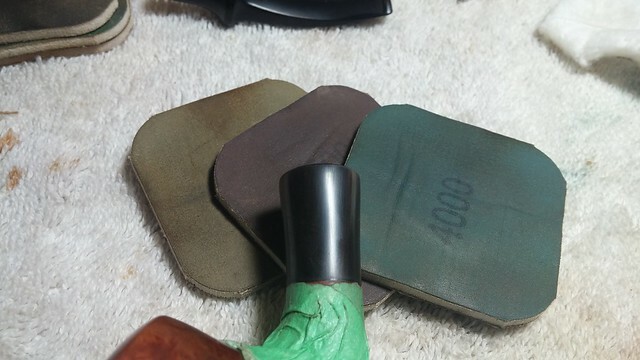 As you can see in the pics below, the bowl’s angular shape is very subtle, more easily detected by feel than by sight. 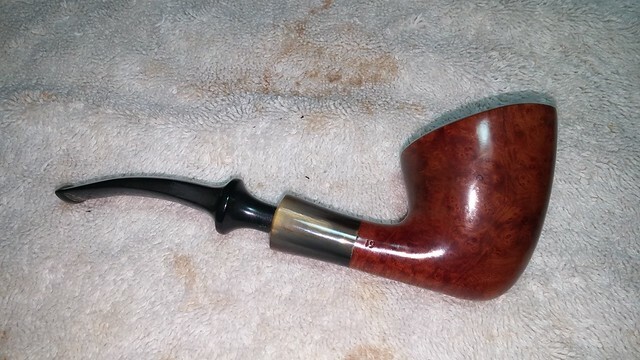 I would personally describe the shape as a modified Bent Dublin with crowned rim. 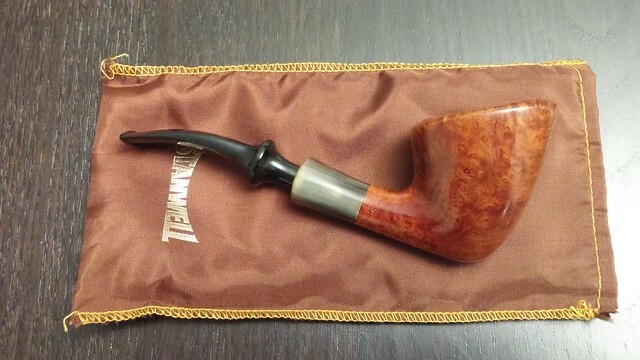 The Brazilia series, infrequently spotted in estate pipe listings due to limited production numbers, takes it name from the source of the horn used for the shank extension. 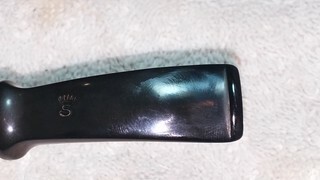 This dark, black and grey striped horn really pops when polished. 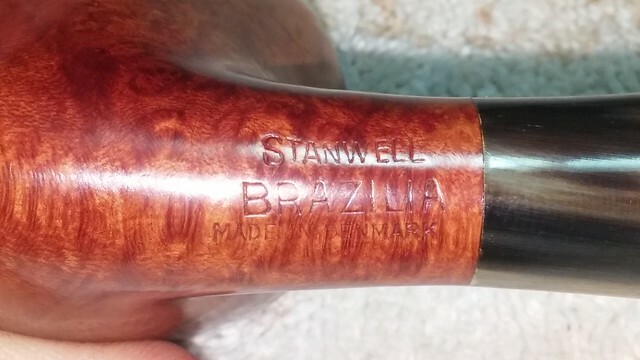 The pipe on my worktable here is stamped “Stanwell” over “Brazilia” over “Made in Denmark” on the left shank. 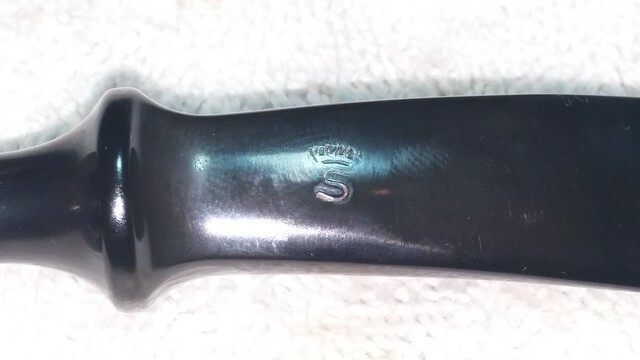 The right shank carries only the shape number, “19”, while the stem is stamped with the Stanwell Crowned S logo. 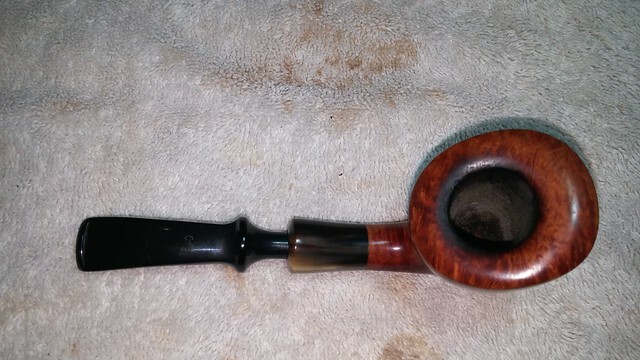 The pipe was lightly used but hadn’t been cleaned for a while. There was a crust of lava reaching up the rear of the rim, though the majority of the pipe was unblemished. 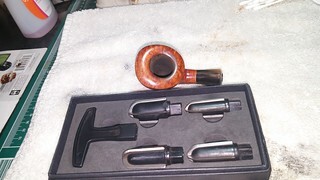 The stem was slightly oxidized and had a little tooth chatter that would need attention. 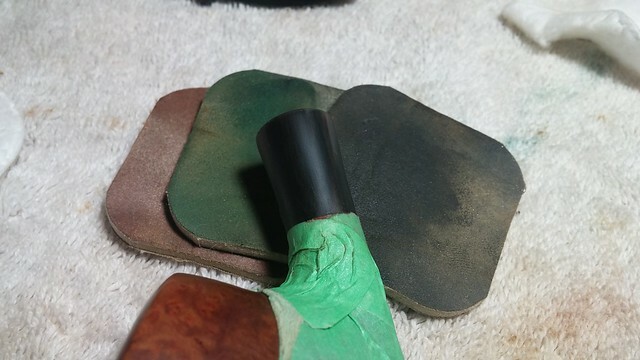 Neither of these issues was particularly troublesome; the one that caught my attention was the Brazilian horn shank extension. 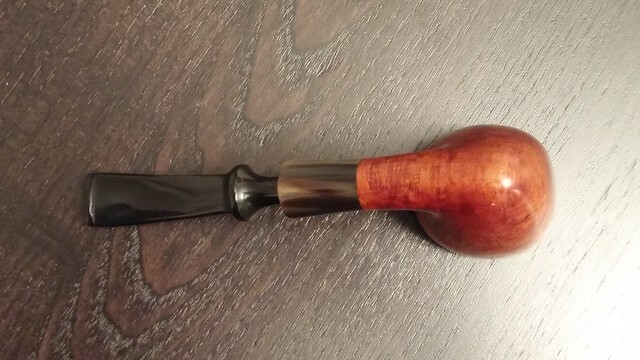 It had two long, thin cracks running from the mortise down towards the junction of the horn and briar shank. 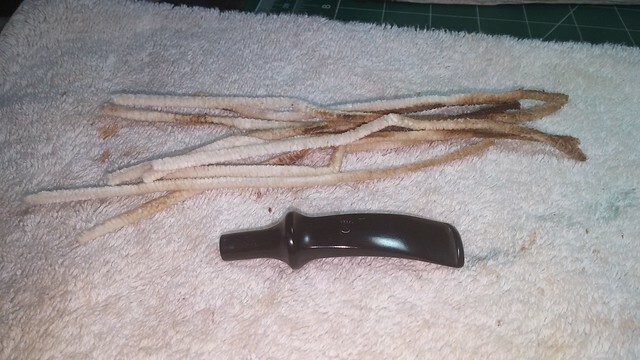 My Castleford reamer set made short work of clearing out the light cake from the tobacco chamber, though it took a few pipe cleaners and cotton swabs dipped in alcohol to get the internals cleaned. Military-mount pipes have a predilection for hoarding tars in the mortise. 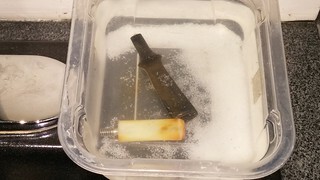 While I worked, the stem sat in a bath of Oxyclean and warm water to soften the oxidation. 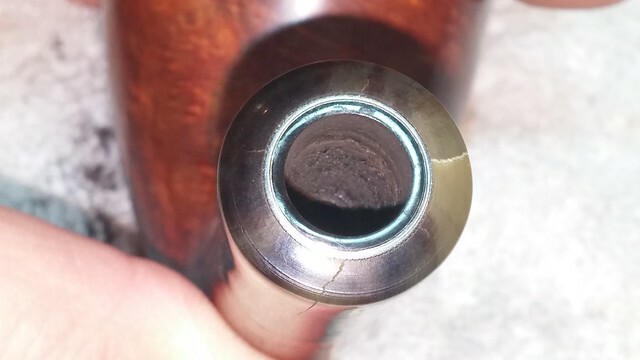 This image shows the extent of the cracks in the horn. 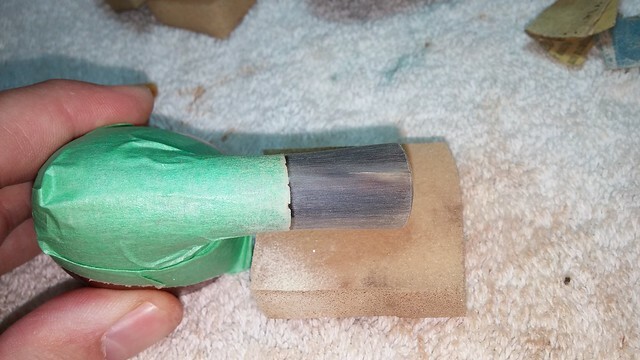 They start at the mortise insert, wrap over the edge of the shank end and run vertically down the horn. There is no sign of trauma or other damage that might explain the cracks. My feeling is that they occurred naturally as the horn dried over the years. 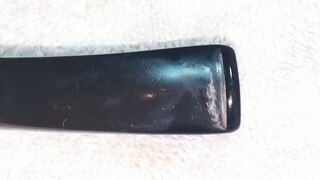 The mortise insert appears to be made up of a tube of vulcanite set inside a metal tube. 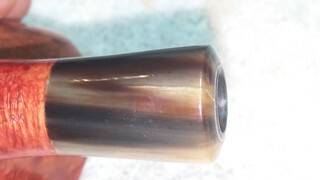 The entire insert looked to have then been embedded in the end of the horn extension. 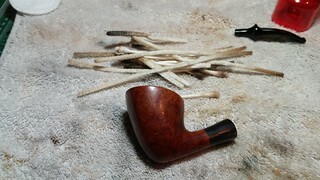 As the mortise is already reinforced in this manner, I didn’t feel it necessary to attempt to shore up the structure of the shank. I simply flowed clear CA glue into the cracks and let it cure. 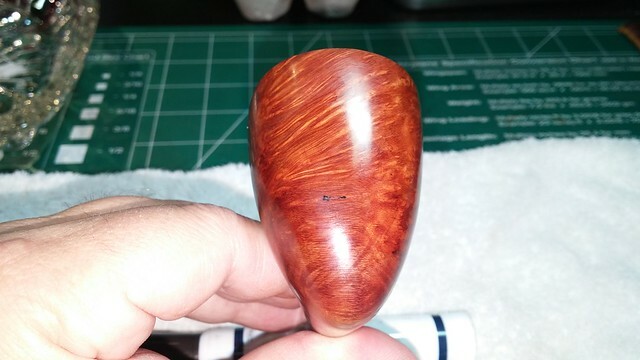 When it was set, I taped off the briar portion of the shank and used 220 and 320 grit sandpapers to level the patches. 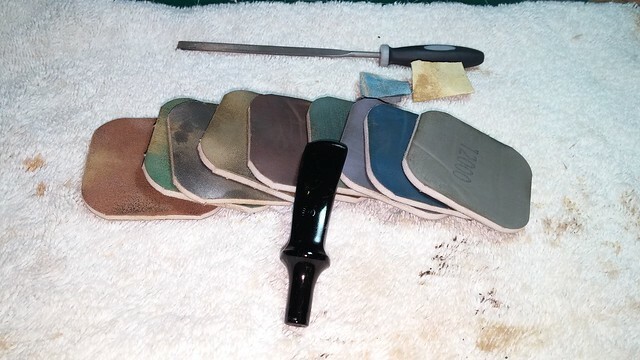 A full course of micromesh pads smoothed out the sanding marks and brought the horn to a high shine. Looking good! The cracks are invisible after the repair. 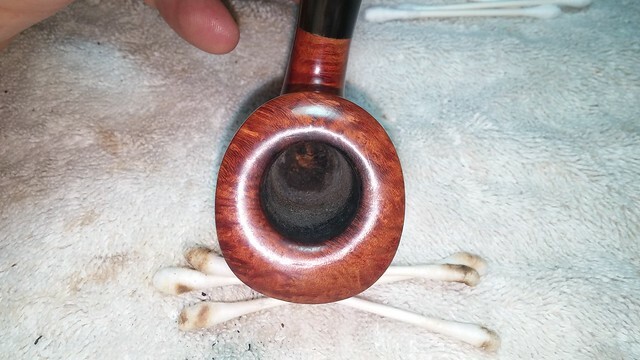 When the stem had soaked for a few hours, I pulled it from the Oxyclean soak and scrubbed away the softened oxidation with a bit of Magic Eraser. 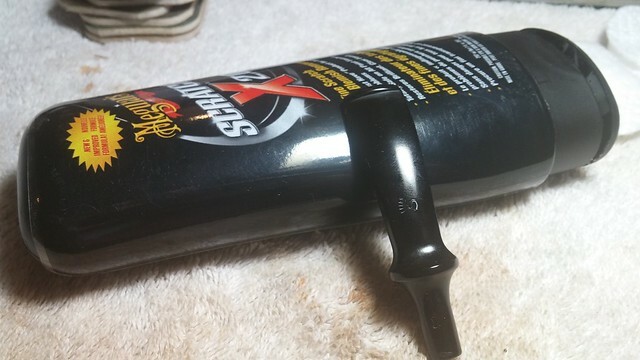 I followed up with a touch of Meguiar’s Scratch-X plastic polish and then cleaned the internals with pipe cleaners and alcohol. 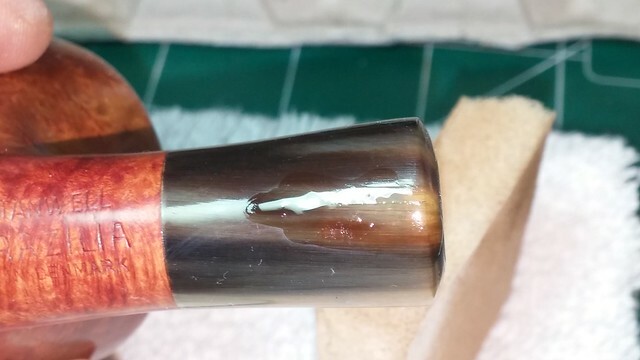 I sanded out the tooth chatter and then the stem received the same micromesh polishing as the horn. Shiny! 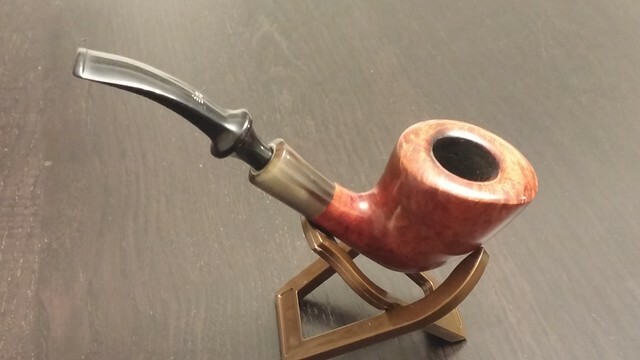 I filled the Stanwell Crowned S stamp on the stem with white acrylic paint and let it dry. 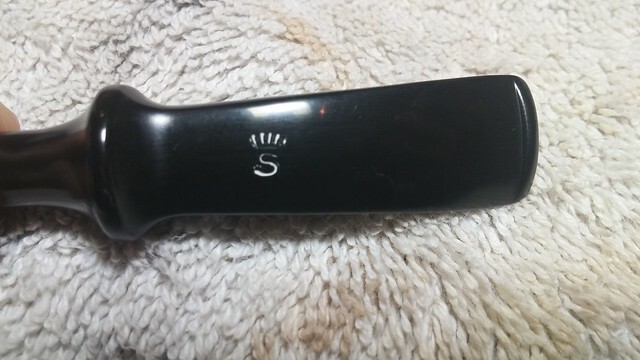 The excess paint scraped away easily, leaving the logo refreshed. 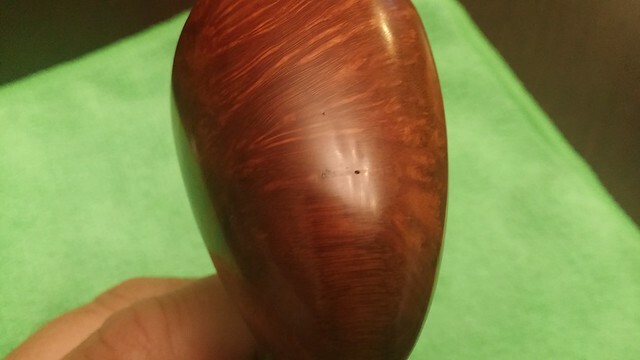 The few stray paint specs visible in the picture would come off during final polishing. 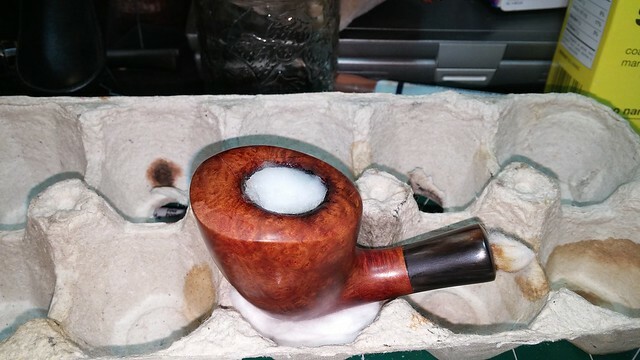 Before taking the pipe to the buffer, I stuffed the bowl and shank with cotton balls, added alcohol and let it sit overnight. I usually used kosher salt for this, but I had run out. As you can see, the cotton balls do an admirable job absorbing the old tars stuck in the briar. 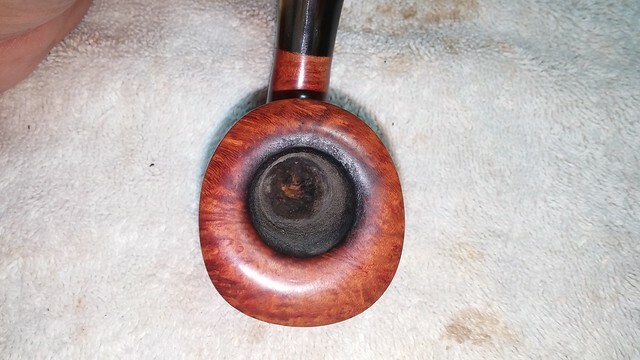 I had just begun buffing the stummel on the wheel when I noticed a tiny flaw in the face of the bowl, which turned out to be a dimple caused by a shrunken fill (one of only two I could find on this piece). Ugh. 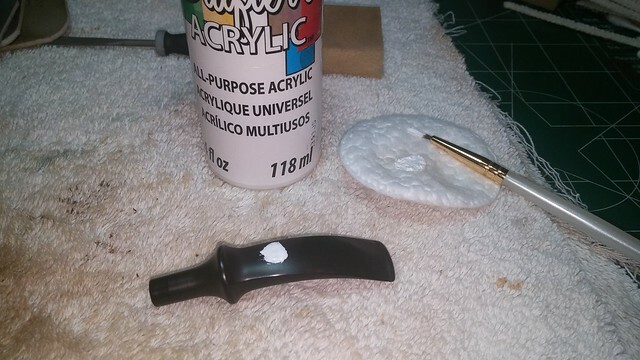 Back to the worktable for a drop of CA glue! This of course, required sanding to level the fill, which in turn required micromesh to remove the sanding marks. 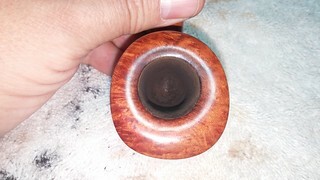 All of that, naturally, left a lighter patch on the front of the bowl where the original stain had been scrubbed away. 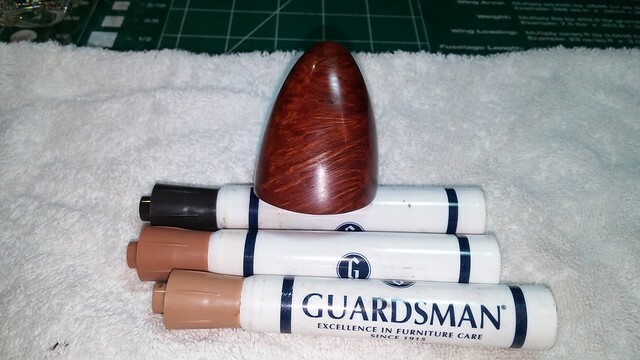 I used a combination of all three shades of stain marker to blend the repaired area into the original finish. 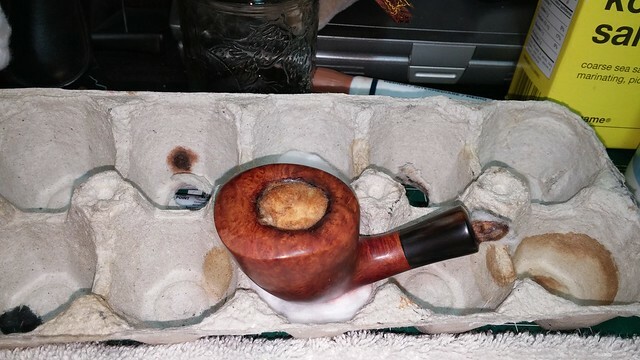 The fill is still there, of course, but the surface of the bowl is smooth and unbroken. The camera flash makes the fill look more obvious than it is. 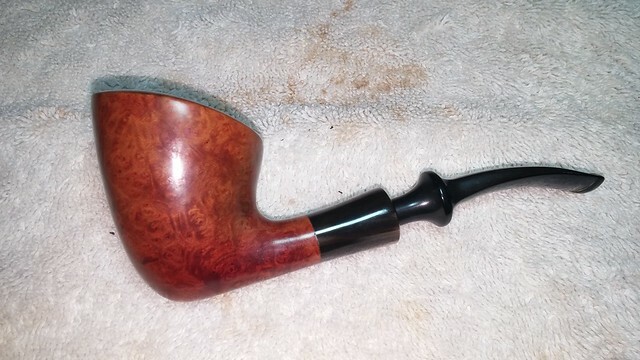 With that little detail sorted out, I took the pipe back to the buffing wheel for a run of White Diamond and several coats of Carnauba wax. 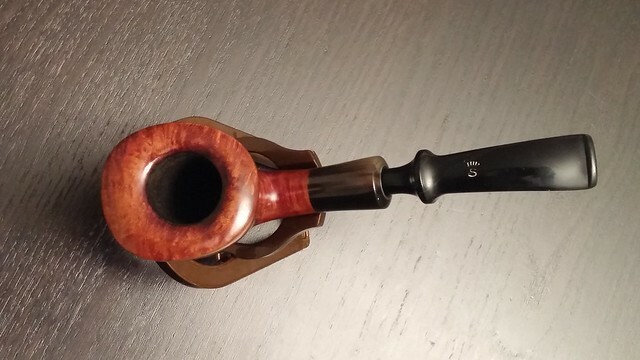 This Stanwell Brazilia is back in action and ready to begin a second career with a new piper. 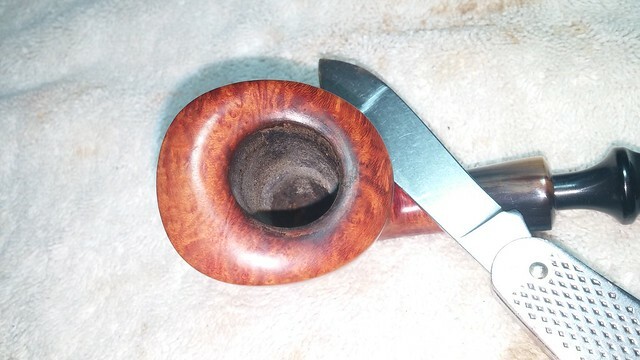 I really like this shape – the unusual contours of the bowl, so appealing to Danish pipe fans, fit the hand beautifully while the Ivarsson design retains just enough “classic pipe shape” to charm the traditionalists in the audience. 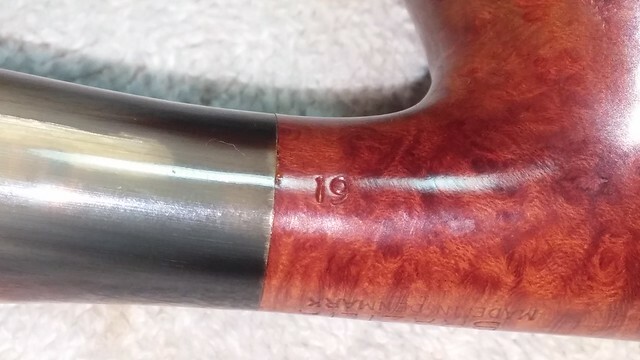 It’s no surprise to me that the perennially popular 19 shape is still in production today. 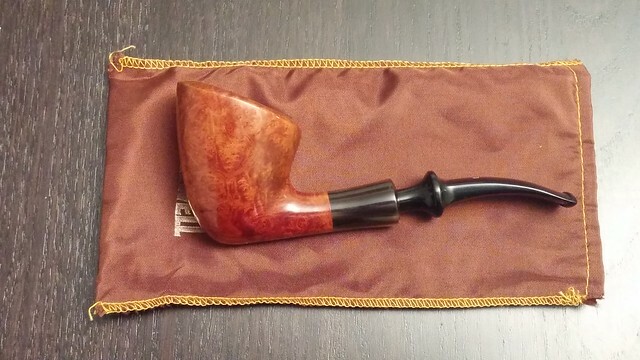 If this Stanwell Brazilia 19 has captured your imagination, why not visit the DadsPipes Store to make it your own. Thanks for reading and until next time, Happy Piping! Nice work on the horn adornment! Thanks, Al. 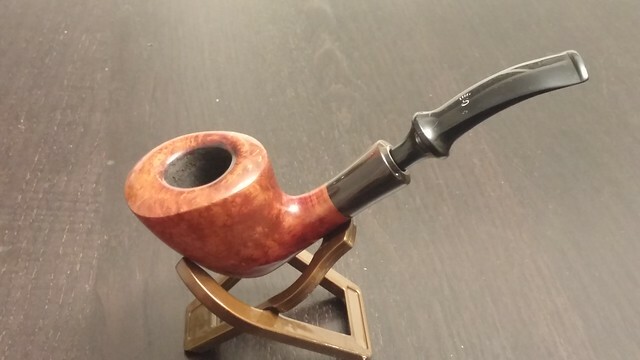 This was my first run in with horn.I actually found it quite easy to work – it sanded well and polished up beautifully.